Make fire to cook, light in the darkness, heat in the cold you just must have fire. While I have previously discussed the heated lawnmower blades as a fire lighter, for many they are not easy to use, especially when so many simple alternatives are available. Certainly the pair of iron strikers will last much longer off grid, often fire is needed fast and easy not eventually. Lets look at some commonly available cigarette lighters and their features, pros and cons. Refillable: usually no, sometimes yes check for valve. Main advantage: cheap readily available. Typical high pressure piezoelectric butane lighter. Some have an LED light as a optional feature. Fuel life span: Fuel often will leak, 2 weeks at most. Ignition life span: often fails before fuel is gone. Cost: medium, often gimmick factor in price. Main advantage: very hot flame, good in windy conditions. 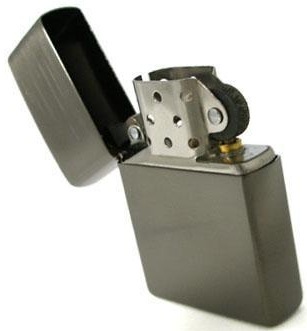 Typical Zippo type lighter. Iconic. Fuel life span: 2-3 weeks depending on fuel, temperature, and use. Main advantages: very robust, big flame, very simple design. Main disadvantages: heavy, difficult to replace flints, fuel will evaporate quickly. 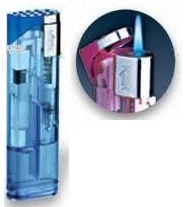 Typical Imco type lighter. One of the better options. Ignition life span: medium, uses flints fast. Main disadvantage: uses flints fast, seem complex at first, lots of sliding parts and a spring. 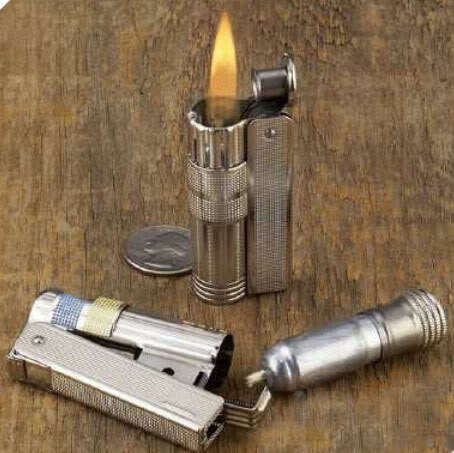 If you already have a Zippo type or Imco type lighter, keep it. If you can justify $20 or more for a lighter, get one of those two, if not, two or three low pressure lighters. Avoid the high pressure lighters, their special feature is seldom needed and they fail often. If you are deciding on a liquid hydrocarbon fueled lighter remember to have fuel and periodically check the fuel levels. Posted in Collapse scenario, EDC, Energy, Fire, Long Emergency, Long term, Sudden crisis. More than you think it does. The bronze age collapse occurred about 1200 BC after flourishing since 3000 BC, a period of 1800 years. This was the single largest collapse of civilization known. The important bronze age civilizations were centered in the area from modern-day Turkey, Iran, Iraq all the way south to Egypt. The bronze age was the time just before the world power in the near east shifted to Greece and the fading empire of Egypt, which then moved to Rome and Carthage. Obviously the bronze age was based on bronze an alloy (mixture of) Tin (~10%) and Copper (~90%). Copper was quite common in the region of the fertile crescent but the tin ores were mined out quite fast requiring extensive trade networks to acquire it. Bronze was used for weapons and armor, allowing war as well as trade to be the mechanism used to acquire it. The trade networks to acquire the scarce tin extended all the way from Egypt to Brittan (which was actually named after its tin ores). It is believed that the bronze age trade networks were almost global, spanning at least 3 continents, Asia, Africa, and Europe, this can be demonstrated by the types of precious stones found in the artistic styles of bronze age civilizations and other items that must have been sourced from very far away. Bronze was first discovered by accident from smelting copper ore with arsenic impurities. different levels of arsenic impurities created soft or hard or brittle bronzes as the arsenic impurities increased. The smarter metallurgists of the time realized that by grading the bronze from soft to hard they could then remelt the high arsenic bronze 10% with the low arsenic bronze 1% to get the best bronze 5%. Arsenic is of course toxic to the metallurgist (causing paralysis)and eventually the metallurgists used tin instead of arsenic. All this smelting consumed large quantities of wood in an arid environment so supply caravans also had to source wood as well as tin requiring extensive trade to create bronze, another way empires controlled bronze. Importantly bronze needed to be cast (poured molten into a mold) to create items, this required a lot of specialized artisans (including the mold maker) working together to create bronze items. This made bronze unlike iron which followed it. Manufacture and distribution of bronze weapons and armor could be controlled by a hierarchy, the bronze armed soldiers could control everything else. Bronze by its nature could be controlled, and it allowed control of populations. He who controlled bronze had total control of their society. Iron can simply be refined and shaped with just three tools, fire, a hammer and water which could be done alone and in isolation. Iron ores were common and impurities weren’t such a large factor in the production of the low quality steel needed to make swords. Iron did not need to be cast like bronze, it could simply be heated and hammered into shape then plunged into water to keep it hard. Iron didn’t generally contain toxic impurities like arsenic so it was safer to experiment with. Tin was not needed to make iron or steel. the most common impurity in the iron was carbon from the fires used to create it, carbon actually made the iron into carbon (mild) steel which was harder than iron. Iron could not be controlled, it was too plentiful and too easy to make once the secret was discovered. 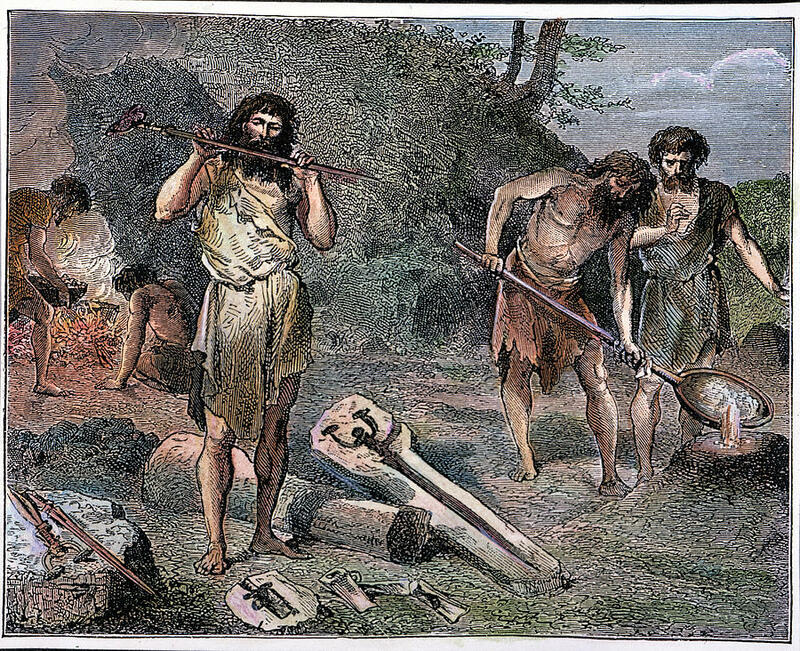 A scene from bronze age Europe. Five men are engaged in the complex process of smelting and casting bronze into a sword. For much of the bronze age different states warred with each other, small empires expanded and contracted, rose and fell, merged or were taken over, one thing remained constant, bronze was the weapon and amour of the professional soldier. The professional soldier was charioteer dressed in heavy bronze chain mail, charioteers worked in a pair on each chariot. One charioteer was the driver armed with only a large knife and a few throwing spears, the other charioteer was an archer with the same knife and a bow with arrows. Chariot wars were quite a spectacle chariots and arrows going in all directions, eventually a chariot would become disabled and the runners would come. Runners were the mercenary army of poorly armed ( non salaried ) peasants that would charge to a disabled chariot and swarm and kill the crew, who were too laden down with heavy armor to outrun the swarm. Each army would have their own army of runners, runners generally didn’t fight each other, they just attacked disabled enemy chariot crews. The Chariots themselves were expensive so were well out of the reach of the local peasant. All of the high technology weaponry was expensive and controlled. Society was highly stratified with a large number of slaves, peasant farmers with smaller numbers of artisans and soldiers and at the top very small numbers of aristocracy and royalty. This system was in place for thousands of years and a real civilization sprung up along with it. The full extent technology of the Bronze age will likely never be known, only hinted at. The explosion in knowledge from this time period is quite staggering. Writing, Law, Stone architecture, Mathematics, complex society, pottery, metallurgy, coinage, irrigation, Navigation,the plow… The Egyptians inherited much of their civilization for the Bronze age near east civilizations, every innovation they had was simply imported from Sumer and its neighbors. Not all parts of the world experienced the bronze age, some societies were forced to wait for iron , either the bronze technology wasn’t available or the cost of tin and copper was just too high. The end of the bronze age wasn’t the end for bronze as a useful material it still had applications in swords but a cheaper alternative became available for the masses. Technology and knowledge for the masses was a hallmark of the iron age, the simplified phonetic alphabet of the Phoenicians was modified and adopted by Greece and later Rome, as it was a simpler (less elitist) system than the hieroglyphic based system that were popular in the bronze age societies. Several things all occurring at about the same time. Silver $30.18 Bronze $0.33 Copper $0.27 Tin $0.82. After thousands of years of irrigation and deforestation soils became salty and less productive, sometimes non productive. Even today not an easy problem to fix, it required digging up all the soil and washing it in fresh water and then placing it all back in the ground. Remember this series of empires was built on agriculture and held together with military might and control of bronze weapons. Because Bronze needed to be smelted and then cast vast quantities of wood were needed to be burned for this process. The region was deforested and in the process became more arid and this amplified the soil salination problem and droughts. For a period of 70 years before the collapse a series of major earthquakes occurred in the northern part of the fertile crescent. It became costly to repair a large amount of damage in agriculturally declining state without a war of conquest. Earthquake damage to major cities would have disrupted major trade routes at the center of the Bronze age empires. Iron smelting, a relatively simple process took away the control of hard metal away from hierarchies. Now anyone could make a sword (and possibly armor) and many people made the Naue type II sword. Iron rich rocks could simple be heated in a large fire to create the pure iron, Iron once created could be beaten into shape with another fire and a hammer. Hot iron could be quenched ( hot iron put into cold water) to increase its hardness. Iron ores were plentiful, iron working quite easy compared to bronze casting, and people were angry. Naue II sword. The first popular sword of the Iron age. The development of iron as a replacement for bronze would have disrupted bronze economies. As trade routes changed and previously profitable businesses, town and entire infrastructure became marginal because of competition with the iron economy and products. The change to iron would have caused significant social upheaval. Imagine a centuries old industry with all its vested interests suddenly coming into competition where none existed before. Huge monopolies would have collapsed. For about 100 years (1300BC – 1200BC approx) there were no wars between major powers, leaving the mercenary armies with little money and growing ranks, and states reluctant to attack each other to solve economic problems. Peasants weren’t accustomed to fighting against peasants from neighboring states and were more likely to see them as friends and not enemies, perhaps seeing their own greedy faltering state as a real enemy. As an economy develops there is a chance it will become too specialized and too reliant on monopolies. If critical monopolies fail, the entire structure of the economy can fail. Needing tin from Britain, a break in the supply line could be disastrous, could there have been a tin and/or bronze supply monopoly that failed, leading to a collapse? With just a hand full of states all located in a relatively small geographic region having the majority of power, any small localized event could destroy the entire empire. Apart from Egypt all the power and grandeur of the bronze age was located in the east and north. A calamity in the center restricting trade would be disastrous. Egypt’s major contribution to the empires was slaves and food, once the flow of theses resources was restricted a collapse was inevitable. 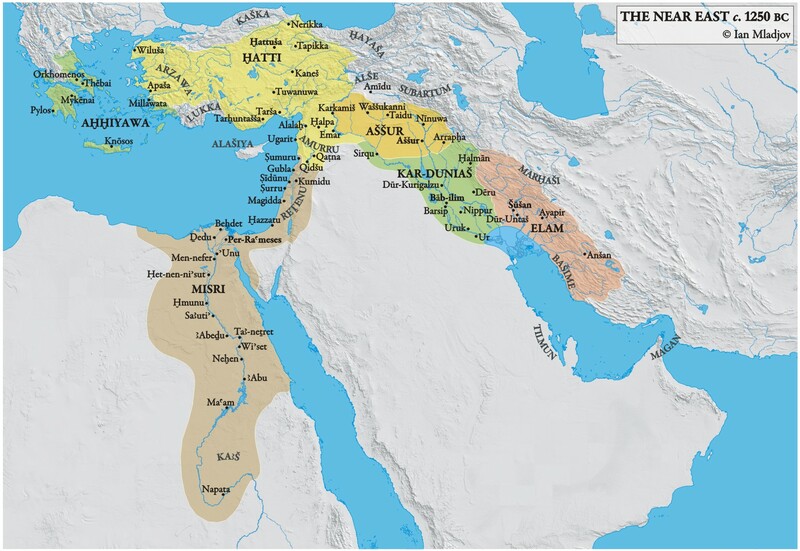 Map of the near east Bronze age civilizations just 50 years before collapse. This region was the Centre of power for north Africa, the near east and much of Europe. All of these factors lead to a group of people called the sea people forming a large army (armed with home-made iron swords) and sweeping through the region from north to south basically destroying everything in their path and collecting more recruits from the disenfranchised populous destroyed cities (many of which had already been damaged by earthquakes in the preceding decades). The sea peoples traveled by small civilian ships frequently but fought on land. Because the sea people destroyed almost every thing. There are few records of exactly who they were or their exact path of destruction. Like the atomic bomb attack on Hiroshima, Nagasaki had no idea of imminent danger, the devastation in Hiroshima so complete, that no one was alive and credible enough to recount the event. Many cities had no warning the sea people were coming. Any one likely to have told them was either dead or had joined the sea people. One thing is known, The Egyptians had learned of them before they arrived and battled them at sea and destroyed their army. Afterward Egypt had lost its major bronze age trading partners and went into decline. Looking at the map of the central bronze age civilizations it seems that the sea peoples attacks cut the empire in half, cutting Egypt away and destroyed all the trade routes to Egypt. Catastrophe design in trade networks. the Sea people were the catalyst for the complete overthrow of the bronze age empires. Addition: Likely identity of the sea people; Aegean Greeks. Research seem to point to a confederation of Greek sea going pirates from the Aegean sea. Several thing point to this. The early Greeks would have had access to Iron from Azarwa or Hatti in modern day Turkey. Their homeland was made from many small islands which made them good sailors and sea travel was normal for most people. The large number of islands would make a perfect place for pirates to hide their loot and ships and forma natural barrier to invaders or reprisals. Sailing into uncharted island chains is hazardous as reef (rock or coral) can easily destroy invading ships. Tales from he Iliad effectively tell of the raids the Aegean Greek pirates did in the Mediterranean. The pattern of raid match the sea people raiding from the north and then clockwise around the Levant until finally reaching Egypt when all other the loot had been picked clean. The sea people most likely followed the coast line and didn’t require complex navigation and hence made longer and longer journeys hugging the coastline until finally reaching and being defeated by the Egyptians. It likely the original Sea People added other nations and even refugees to the pirate confederation as the raids continued so it became not just one ethic group doing the raiding to confuse matters for historians further. The tales from the Iliad span several generations which seem to mirror the transition period from Bronze age to Iron age. Some island settlements in the region show special defenses against sea borne attack having bee created on mountain tops with difficult to see trails leading up. Such a settlement would be quite impractical unless a pirate raid was a serious risk, this of course points to pirate raids being a serous problem for an extended period of time. The land based raid (possibily supported by sea going vesssels) seem to fan out from the city of Troy in more or less the same direction as the sea based raids supporting the idea of one localized confederation being the source of the pirate raids. 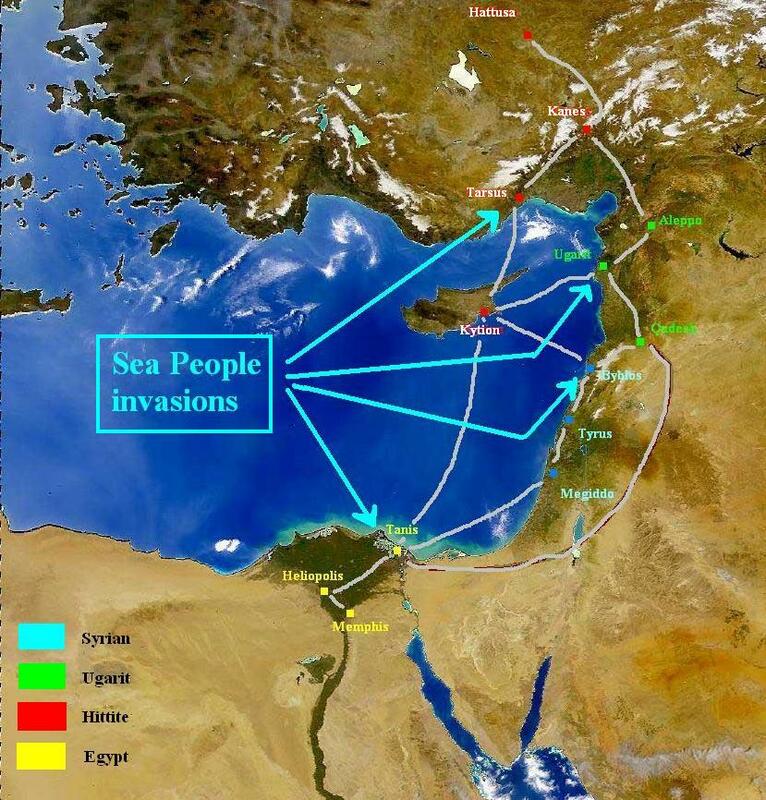 The Sea Peoples and their invasions into the Bronze age civilizations. While no-one is certain where they came from, Cyprus is one of the possibilities. about 2 new generation of people growing up in the chaos of transition from Bronze to Iron, in a world where ancient empire once controlled everything, now everything was uncontrolled. Then Greece and Phoenicia started to form as the first iron age empires, on the north-western and western outskirts of the former bronze age fertile crescent. The rest of history since the Greeks and Romans is known quite well, But have we learned lessons from the circumstances of their rise from the ashes of the previous empires? Icon of the 20th century, the Oil age. Hard rock mining and fracking, both are creating major environmental problems, fracking threatens to poison the water table important for agriculture and drinking water supplies. Fracking shows the true desperation to gain the last remaining combustible liquid hydrocarbons from the earth at the expense of any other current or future use of the soil. The oil age is ending. Remember the bronze age ended with an abundance of bronze, and there is still plentiful bronze now 3200 years later. As oil ends so does trade and large amounts of industrialized food production. In sad irony oil is required for the industrial scale production of food, but destroying the land and water table required to grow the food to get the oil seems counter intuitive. Counter intuitive until you realize that corporatist thinking only focuses on profit and all other matter are externalized to the point of being non-existent. Incredibly blinkered thinking enshrined in corporate mentality. Natural disasters -US Hurricanes, Earthquakes, oil void collapses? The US has endured some significant hurricanes and ocean borne storms in the last 5 years in the region of the business banking and government hubs on the east coast of the USA. Not to forget deep water horizon a major oil exploration disaster poisoning fisheries and riparian zones in the south-east. Oil once removed from the ground leaves a void which i often filled with water to help float the oil to the surface. Water is unlike petroleum in that it does not create pressure by releasing gas in response to shock. A void filled with oil stabilized the void, how else could it have been in the ground so long? A void filled with water will not significantly out gas to pressurize the void. the water will instead seep into fractures and lubricate them (better than oil strangely) and exacerbate any earthquake conditions. eventually the void will collapse creating or amplifying an earthquake. How many of these void do you think there are? 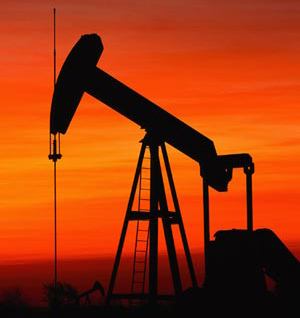 Are they a ticking time bomb ready to detonate at the end of the oil age? Destabilizing technology – Internet, 3D printing, others? The established order is under threat from many sources who seek to change the way things are done. Information can now be spread wide fast and low-cost. The 3D printer allows a thing to travel in information format and be replicated almost anywhere. A recent development in 3D printing is rifle parts, rifle are in most places a restricted (controlled) item. these controls are dissolving. A very strong parallel to iron make the sword common place in the beginning of the iron age. Could the 3D printed rifle be the last gasp of the oil age? A large-scale war of ‘new sea people’ armed with plastic home printed guns? Economic changes – Fiat currency under threat. People are beginning to realize fiat currency is just a scam. The established order relies on this scam not being revealed as they are reliant on fiat currency to maintain the empire. Will a real economy emerge to challenge the old one? A great deal of the major parts of the economy are monopolies or are near monopolies, all primed for a single event to collapse their networks. accomplish two goals. reduce working class population and reinforce/reorganize states as the mechanisms of power with more ethnically homogenous populations. Even after WW2 had ended people were relocated all over Europe (and the world) based on ethnic lines. 1914- 1945 A period of 31 years where about 6% of the world’s population was killed, the survivors became under the control of states (not ancestral monarchs) and the newly developed, city destroying, atomic bomb. So in the last 67 years population have grown significantly, with no wars to cull out people, a population bubble is forming. Our economic networks are complex and fragile, more so than was ever possible in the bronze age, just in time supply and algorithmic trading being examples. Much of our world trade is based on oil, the transport of people, things and food; all reliant on oil. Oil as we know is running out. Trade networks face total collapse once oil becomes too expensive or unavailable. Power centralized in a few places in the world, Washington DC (military), City of London (financial), Vatican City (religious), Mecca (religious), Zürich (financial) Frankfurt (financial), Beijing (Military, Financial, Manufacturing). Four of these centers of power are in Europe currently under its own economic and currency crisis. 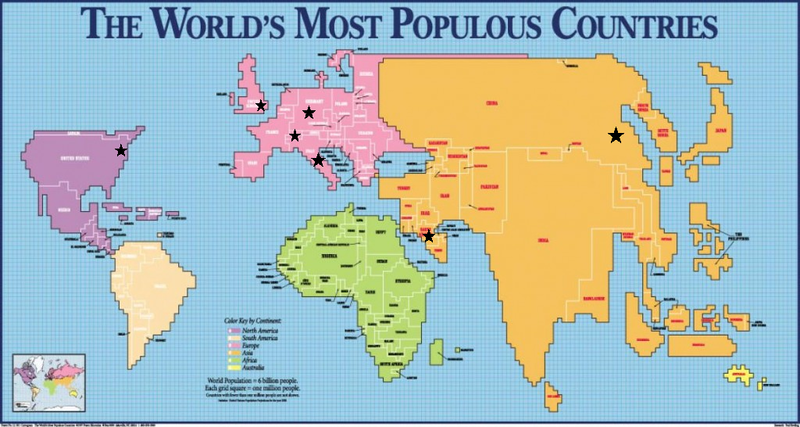 On the population map look at how power seems to be where population is small and concentrated. Three continents seem to have no power at all South America, Africa, Australia. People are being robbed by their governments and are understandably angry, but what form will their resistance take, and how long will they wait before demanding change that can’t be ignored. Could fiat currency be phased out without significant transition problems? Europe with four significant centers of world power in the grip of austerity and a unified currency that is rapidly loosing confidence. Is another European war in the future likely? Could the center of world power move after a collapse of European power, to one of the other centers of world power, Washington, Beijing or Mecca? Will people accept being squeezed economically into an even lower standard of living? When will people reach their breaking point and simply rebel? Transition – To what and how long will it take? People want life to be different, what do they want and how long will it take to achieve amid the chaos of transition? Will people fall into the trap of simply recreating the same unstable, unfair system all over again? Will another’ sea people’ arise? what role will the internet play in the end of oil and the beginning of something new? Could the internet reduce the transition time? Could the internet allow for a completely new type of economy based on 3D printing and virtually free information? Posted in Collapse scenario, Community, Educational, Food and Gardening, Geopolitics, Long Emergency, Long term, More to come, Political theory, Resourses - physical, Sudden crisis. Some great info here. I’m especially interested in the wood gassifier for converting small pieces of wood into a fuel substitute (CO + H2) for internal combustion engines. Quite a large resource. Along with the wood gassifier I’d like to highlight some of the other topics in later posts. Posted in Collapse scenario, Educational, Energy, Long Emergency, Long term, Sudden crisis.